and have current pet ID tags." Does Your Cat or Kitten Need One? 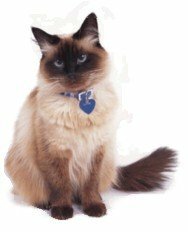 Safe cat collars with identification tags should be worn by all cats! Yes, even indoor and microchipped kitties should wear collars with pet identification tags! Natural disasters happen every day (earthquakes, floods, fires, etc.) that can leave your cat outside and lost. A repairperson coming into your home while you are away, or someone accidentally leaving the door open, can allow your cat or kitten to wander away. According to the ASPCA, very few cats without a collar and current identification are reunited with their people. These two items are essential for your cat's health and safety and for your peace of mind. The other type of safe collar is one with an elastic panel that will stretch in the event that it gets stuck on something. The safest pet collar, in my opinion, has both a breakaway feature and an elastic panel. If you allow your cat to go outdoors, please consider a reflective collar for added safety on dark nights. And one with a bell is always appreciated by the birds and bird lovers in your neighborhood! A cat collar should not be so tight that it irritates (or chokes) your cat, nor so loose that your cat can easily slip it off. A general rule for a good fit says that you should be able to fit two fingers between your cat's neck and the collar. If your prefer, you can also measure your cat's neck (pull away her hair so you can get close to her skin) and add one to two inches. This should be the measurement of a proper fitting collar. Check the fit frequently to make sure that the collar is on properly. Be careful that the elastic on a collar with an elastic panel has not become so stretched out that it could fall off of your cat. All cats should have an ID tag on their collar. Your cat's name, your name and your current contact information should be included on the pet ID tag. A collar with your visible contact information is your cat's ticket home to you. According to The Humane Society of the United States, pets found wandering without visible identification have a tragically poor track record of being reunited with their people. Many of these unknown and unclaimed cats will perish in shelters while their "owners" search frantically. Cat Supplies - List of essential supplies for your healthy cat.